Have your hair washed and styled by one of our amazing team. We aim to ensure everyone enjoys their experience and walks away with fabulous hair. Have your hair washed and styled creating beautiful, shiny curls. We will guide you through a consultation offering you professional advice on how best to colour your hair and maintain a good healthy, shiny result with the amazing Goldwell colour range. We offer free colour consultation to discuss your requirements and to create your own look, this also includes a strand test so you can see the colour before you have the service and a skin test which is compulsory to ensure your safety. Wildabouthair stylists will create a personalized haircut and finish to suit you and your styling needs. Enjoy a little luxury for your hair as well as a personalised haircut and finish you will also be pampered with a full head massage and one of our personalised treatments to help restore the moisture and shine of the hair. Non damaging smoothing and defrizzing treatment. Leaving you with beautiful, shiny manageable hair. Our luxury perms are developed to ensure you hair is in its optimum condition, creating beautiful, shiny curls and waves or just volume. We offer a free perm consultation that includes perm test of your hair. Our perming experts have over 20 years perming experience. 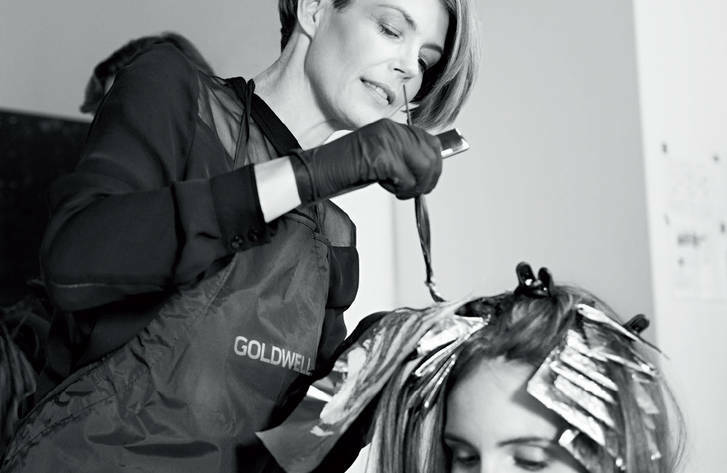 We use Goldwell Professional products for our services that will help create amazing looking hair. We also offer advice on all homecare using Goldwell professional range of products so your hair can always look like you have been to the hairdressers.